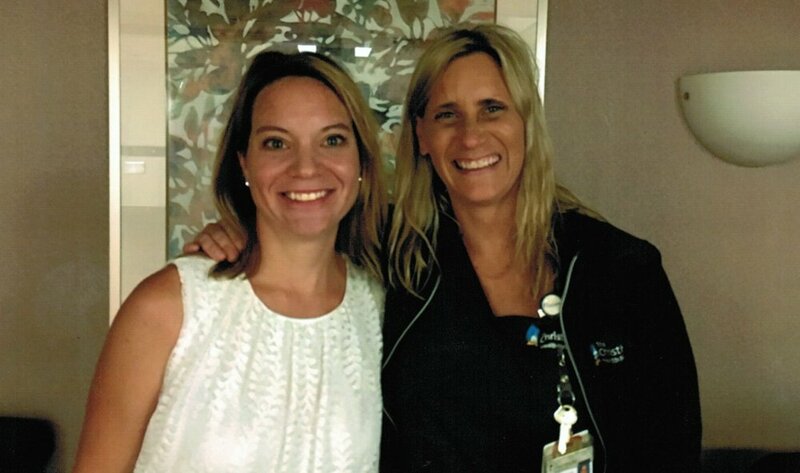 Altruistic kidney donor Julie Johnson (left) and Jessica Enzweiler, RN, her Christ Hospital donor coordinator. No. I was an altruistic donor. Initially, I wanted to locate my own recipient, but I found I was being judgmental during my selection process and wanted to take that element out of the equation. This answer evolved over time for me. After my father’s sudden passing, in August 2016, I needed a motivation to inspire me to move forward. I wanted to do something personal and remarkable. I think the idea of donating was God pulling me out of my sadness and giving me a focus. Donating a kidney is not something many people get the opportunity to experience and having been blessed with good health, I felt I was a likely candidate. Eventually, I realized that God’s hand was involved the moment being a donor entered my mind. Prior to that, I had no knowledge or personal experience with anything remotely related to kidney disease. Frankly, I didn’t even realize people did this sort of thing. There was no decision to be made. My path was one direction from day one. The only initial struggle I had was whether to find a recipient myself or became an altruistic donor. I knew this was what I was meant to do at this point in my life and I never looked back. As probably anyone would be, I was concerned my kidney might be rejected. I had no fears about my own health or recovery as I felt sure that it would all work out as it should. Initially, I only confided in my husband, my manager and two close friends, in case I didn’t make it all the way through the process. My husband was terrified and didn’t understand why I would want to do this, but he offered his support. When it became a reality, I told those I thought might want to know. The overwhelming majority were very supportive and proud. A few came off as nonchalant or blasé. There were only two that expressed negative concerns and rebuttal. I took into consideration those people around me whose opinions really mattered, coupled with my assurance with God, and stayed steadfast. My surgery was what I would consider rather easy. Once I arrived, it was a whirl-wind of IVs, repeating my name and birth date and introductions to the staff that would be taking care of me. I’m told it lasted four hours, but of course I don’t remember. The doctor assured my husband that I was a textbook case with absolutely no complications. I tend to not do well lying around. As a result, I tried to sit up too soon after surgery and got sick from the side effects of the anesthesia. After that, I took it slow… for a day. I mostly just slept and anxiously awaited the time when they said I could be discharged. I had no complications and recovered rather quickly. I had discomfort and some fear of what pain I thought I might have for the first few days. By a week’s time, I was feeling “normal” though still slightly tired. The second week I was back to work (from home) and driving and even walking a good distance – considering I just had major surgery. The third week I was doing everything I normally did. I listened to my body and pushed myself just enough to make progress, but not enough to set me back. The only difficult part was when I had to sneeze. For some reason I sneezed more after surgery than typical. That was a little terrifying at first because there was discomfort and I felt like body parts were moving around on me. I worked from home the second week after recovery and went back into the office by the third week. My job is not physically demanding so this was not an issue. I submitted my paperwork in January 2018 and donated on August 21, 2018. There were a few hiccups along the way because I have a hypothyroid that likes to mask symptoms that would normally be attributed to other things when it is not cooperating. As well, I really wanted to wait to donate until August in order to commemorate my father’s passing two years previous. I did request the candidate be someone on the Christ Hospital kidney waiting list so I would have the connection of the person being local. I was surprised by the mild reaction of my recipient. During the process, I had been in contact with a donor whose recipient did not want any contact with him, so I was aware this was a possibility. Two months after the surgery, my recipient and I talked on the phone twice, but so far that has been the extent of our communication. I have always said I wanted this person to have the decision of how much if any, s/he wanted to speak with me. I still stand by that and respect their privacy. Absolutely, without a second thought. I am only sorry I have just one kidney to give while I’m alive. There are no regrets about the decisions I made or the outcome.